Currently, the Smuckers have a small aquaponics system upstairs in their house, but what they plan to do is tear down their garage and build a 700-square-foot greenhouse in its place. They hope to have this completed later this year. On May 26, the couple gained approval from the Goshen Board of Zoning Appeals to construct and operate a commercial greenhouse. After other hurdles are cleared, including cooperating with the Elkhart County Health Department regarding greenhouse construction and further discussions with the Indiana Department of Environmental Management, the year-round facility will produce up to 500 pounds of produce and 20 pounds of fish monthly. “Zoning is set for the next five years,” says Noah. Noah’s interest in aquaponics was born in Phoenix, Arizona, where he grew up. He remembers seeing lots of crop irrigation and felt there had to be a better way. Later, he visited the University of Arizona’s Biosphere 2 and its replicated ecosystems and knew he wanted to be a part of something more sustainable. Ruth grew up in Essex County, Ontario, an area that competes on the world stage when it comes to hydroponics. Her aunt and uncle had a hydroponics farm in Essex County, which is near Point Pelee National Park and its niche ecosystems. Through hands-on experience and learning in school, Ruth gained proficiency in indoor sustainable agriculture. “In high school I did a 20-page research paper on hydroponics,” she says. Personal health issues also led Ruth to become interested in farming, as she believes that healthy food has the power to heal. She’s a better farmer than she ever thought she would be. “I didn’t know I had a green thumb,” she says, jokingly. While Ruth was interested in hydroponics for health reasons, Noah’s interest in using technology for farming grew. When the Smuckers got married, they not only wed each other, but they joined their passions for sustainable agriculture. 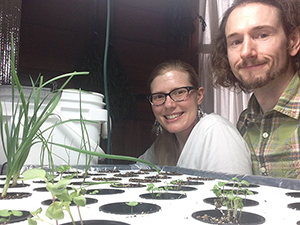 Noah has been researching hydroponics and aquaponics for years and years while Ruth’s love for agriculture was enhanced by her gardening experiences. When the Smuckers were trying to figure out next steps in launching their own aquaponics endeavor, they came across a company (they were not at liberty to disclose its name) that not only offers a standardized aquaponics system, but even offers training. They will use this system for their new greenhouse aquaponics facility. In their greenhouse, they will raise tilapia, and will possibly have some guppies. Crops will include a variety of peppers, tomatoes and greens, which they will market to area restaurants, farmers’ markets, the local food co-op and CSA’s. Ruth and Noah have raised some capital for the project through a local crowdfunding source, Goshen Funded. So far they are pleased with the reaction to their project. Ultimately, the Smuckers hope to have several aquaponics greenhouses within the Goshen city limits. They already have their sights set on several locations in an industrial area. Another goal is to become organically certified. But regardless of certification, they plan to grow all crops as organically as possible. In the meantime, the Smuckers will keep planning, listen to what people need and want, and launch their aquaponics greenhouse as soon as possible (hopefully by fall).